Hi, I’m Kristopher “Crucial” Waldrep. I’m a tattooer at Gill Montie’s Tattoo Mania in Beaumont, TX. 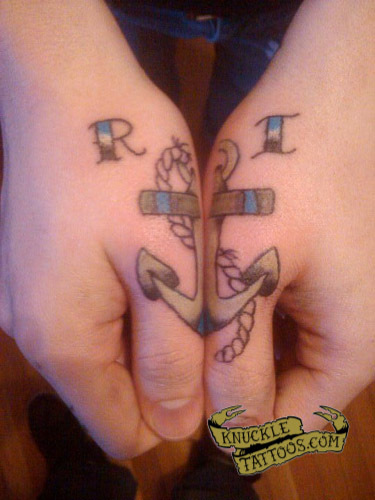 My fingers were tattooed by Waylon Hart from Anchors Aweigh in Sugarland, TX. I got 409TX because that’s where I’m from and TM601 to represent Tattoo Mania 601 Park St.
My thumbs were tattooed by Shane Montie on a Friday the 13th, hence the lucky number 13. I got cake on my left hand to cover up the foolish tattoo i got when i was married. The K is from my ex. After realising that it wasnt working out i had to get rid of it or get something else, My brother thought of using CAKE and his reasoning was that everyone likes cake. I thought it was a pretty good idea. Im in the process of getting LIFE on my right hand and IS on my thumbs. i’ll send in pics when its done and i think i mght poach an idea from your site and go with the pacman theme on my lower knuckles. Hey it’s miles again. I sent in my left hand awhile back. 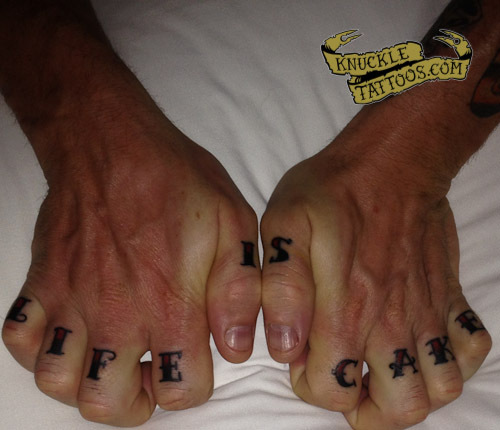 I got my second stage finally done on my knuckles. Thought I would send ya a pic. I got the new ones done at Ink Addiction in Saskatoon. If you want a better pic let me know.